Bryce Canyon is Utah’s smallest national park—-a glistening jewel cast in hues of yellow, pink, orange, and red. But its name is a misnomer because it isn’t a canyon. Canyons are carved by rivers, while Bryce Canyon is actually a series of eroding cliffs on the eastern rim of the Paunsaugunt Plateau. The cliffs have formed brightly colored rock amphitheaters decorated with bizarrely shaped ridges, fins, and hoodoos. This otherworldly landscape, replete with windows, arches, and natural bridges, fuels the imagination and makes for irresistibly fun hiking. Bryce is Utah’s highest-elevation national park, and as in Utah’s other national parks, you can read Earth’s history in layers of stone. Geologically, Bryce can rightly be considered the uppermost rim of the Grand Canyon—a relatively young Cenozoic layer, softer and more quickly erodible than the formations found in other national parks in the Colorado Plateau. Because it’s high and dry, you’ll find an intriguing variety of alpine trees and shrubs in Bryce that are not found in the lower elevations of the Colorado Plateau. Bryce Canyon is also home to a huge variety of wildlife, which sometimes include bobcat, mountain lion, and black bear. The plant life is even more diverse–home to over 400 species–including a number of evergreen tree species that make up a pleasant mix of forest and meadow space that contrast the sharp rock features on the “canyon” walls. Ebenezer Bryce’s cabin, where he and his family resided in the canyon (source: Wikipedia). Bryce Canyon became a national monument in 1923 and was designated as a national park in 1928, in attempts to protect this fragile landscape from overgrazing, the logging industry, and the increase in tourism that resulted in publicity drummed up by railroad lines leading out west (source: Wikipedia). Bryce’s small size and linear layout mean it can be easily visited in one day. Even if all you do is stop at the viewpoints on the rim, you can see a high percentage of the park. But the greatest hikes in Bryce lie below the rim and require you to lace up your boots and hit the trail. Begin with a stop at the visitor center, and proceed by car or shuttle to Rainbow Point, on the park’s southernmost rim, for a short walk on the Bristlecone Loop. Because all the viewpoints are on the east side of the road, stopping at them is most easily done on your northward return, thereby requiring no left turns. When you arrive at either Sunset or Sunrise Point, hike the 3-mile Queens Garden and Navajo Loop, which is not just the finest hike in the park but is also arguably the finest short hike in America. 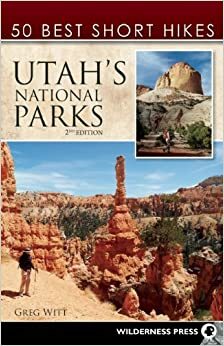 Portions of this article were excerpted with permission from 50 Best Short Hikes in Utah’s National Parks 2e, by Greg Witt (Wilderness Press). Like this post? Subscribe to our FREE monthly newsletter for even more stories of travel and adventure, right from the trailhead to your inbox.